Exelero – the legend livesJust imagine an automobile that combines the elegance and first-class quality of a high-end limousine with the powerful suppleness of a sports coupe. Create a vehicle in your mind’s eye which, with an unladen weight of over 2.66 tons and the dimensions of a small transporter, achieves a maximum speed of over 350 km/h. For 99 years, Fulda has been making car tires. For most of this time, the company has advertised its products with special vehicles. Luxury buses, advertising vehicles with special bodies, high-speed buses for tire tests, a whole series of showtrucks, racing cars and – in the 1930s something quite special – streamlined car from the Maybach company which could conduct tire tests at speeds of over 200 km/h. Unfortunately, not for too long, because the test car designed in 1938 and delivered in 1939 disappeared during the war years and never reappeared again. 66 years later: Fulda is introducing a new sophisticated high-tech tire to the market. For the most extreme dimension of this tire line, 315/25 ZR 23, licensed for speeds of more than 350 km/h, and that as a series tire, not a racing tire, what was needed was a high-speed vehicle but not a racing car. A few years ago, one the most exclusive German automobile makes was revived, why not organize a joint project together once again, just like in the old days? Based on detailed and strict time schedules, all three phases were realized simultaneously. The well-known Italian vehicle study manufacturer Stola in Turin was commissioned by DaimlerChrysler to build the Exelero. The sports coupe was also now given its final project name: Maybach Exelero. On 31 May 2005 everything was ready. All three phases were completed. The 1:1 model for the exterior had been tested in the wind tunnel many times, modified and adapted. The interior details were fixed: natural leather, neoprene, coated punched aluminum sheet as well as carbon fiber in glossy black and red are the main materials. And the technicians who worked on the vehicle had arranged, rebuilt and made ready for use all the functions and the parts needed for this. Dipl.-Ing. Jurgen Weissinger, the responsible project technician and development manager at Maybach, connected the battery, turned the ignition key and the car growled into life. The short burst of gas suggested record speeds. 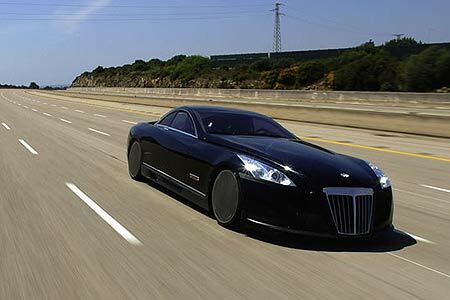 Transforming a limousine, the basis for the Exelero is the Maybach 57, into a coupe is extremely demanding. Jurgen Weissinger and his team were astonished to find that, although the dimensions of the former SW 38 differed in the length (the Maybach 57 has a 290 millimeters longer wheelbase), in terms of breadth and height they were very similar. That simplified a whole series of structural measures. When considering the engine alternatives, it soon became clear that the basic twelve-cylinder engine used in the Maybach limousines would not achieve the desired maximum speed of around 350 km/h despite the Biturbo turbo charger. Here, the Mercedes Car Group leapt into the breach. The engine specialists in Unterturkheim, the place where all basic engines are developed, provided energetic support for the project. After several optimization of the Maybach type 12 engine, the cubic capacity was increased from 5.6 to 5.9 liters and the turbo charge optimized. The result was convincing: on the test bed almost 700 hp and at least 1,000 newton meters of torque were recorded, sufficient to achieve the targeted maximum speed of 350 km/h. Before, during and after the aforementioned work, the individual evolutionary steps were supported by corresponding tests. Either on engine test beds in the plants or on test tracks like the high-speed oval in Nardo/Southern Italy or the test track in Cloppenburg. The final test measurements at the end of April/beginning of May 2005, once again on the high speed Motodrom Nardo, then produced the well-earned success of lost of hard work: a top speed of 351,45 km/h – a world record for limousines – on standard tires. 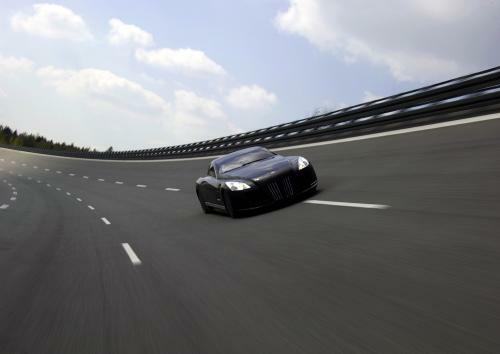 And yet another world record: between the Fulda idea, the outstanding cooperation of all concerned and the delivery of the Maybach Exelero sports coupe, just 25 months passed. Yet again in Fulda Reifen’s company history, a cooperation has led to an exceptional final result: a top-class product like the Exelero ultra-high performance tire is matched by an exceptional vehicle, unmatched anywhere else in the world, the Maybach Exelero sports coupe.